Chutzpah is one of those Yiddish words, like schlep, schtick and verklempt that has entered the English language via Woody Allen movies, Saturday Night Live skits and Seinfeld reruns. We all know what it means, and for those of you who don’t, it’s pronounced “hootzpah” and means “balls”…figurative ones. That’s what Michelle, a college political science instructor, wanted to write on her pink and red balls to make them her own. Michelle was an enigma. Not 15 minutes after she saw my work and chatted with me for the first time at a Valley Art Center Opening, she volunteered to pose for me. Since her offer was so sudden and unsolicited, I wondered if she knew what she was asking to do…she did. I asked her to look at the Chicks with Balls book (which, conveniently was for sale at the Valley Art Center Shop) to make sure she really understood what Chicks with Balls was all about. So she looked at the book…and understood and stuck by her original offer to pose. With a few months to think it over, Michelle came up with a concept and we arranged a posing session at which I was eager to hear her story, get to know her better and set up her ball idea. I also knew that sometimes there isn’t a “BIG” story, or that maybe it’s private. I never ask to hear one because, for me, the act of volunteering to pose is an act of courage in and of itself. 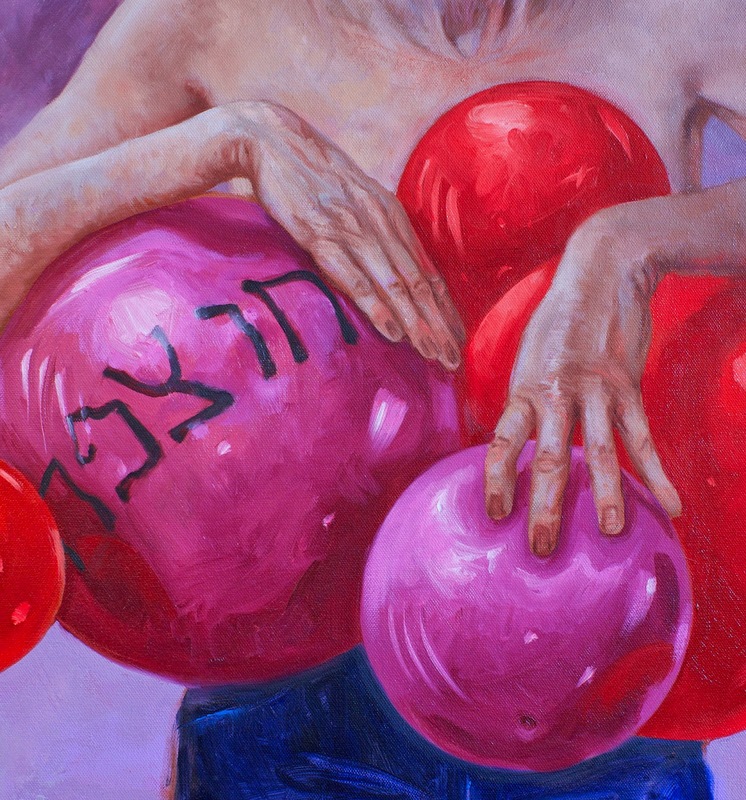 During the posing session, I found out that Michelle was in the process of converting to Judaism, and she wanted to write “Chutzpah” on red and pink balls. 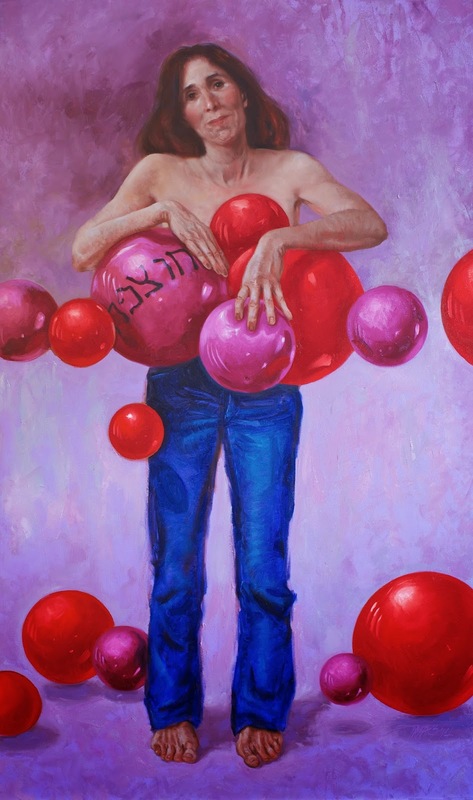 I suggested writing it in Hebrew letters, knowing already what I would name the painting, and that I’d write a blog that left no doubt as to what the letters spelled. As a proud heathen, by choice and not neglect, I very much respect when someone actually goes through the layered thinking process of choosing a religion, and then spends the extensive and rigorous months of learning it takes to convert to it. Much like the way a freshly naturalized citizen knows more about U.S. history than a born and bred native, a convert believes with both eyes wide open. The other aspect of Michelle’s story that I found out during our fascinating morning together is that she lives with the complexities of a brain injury that resulted from radiation therapy for a tumor a few years ago. It left her with hearing loss and some spacial perception differences. She told me this as I was directing her hands into visually interesting positions during our photo shoot. She apologized for misunderstanding my instructions. I reassured her that many people who have no brain injuries whatsoever also become confused when I ask them to put their fingers into a natural looking asymmetrical contropposto configuration that simultaneously shows the veins, the knuckles and the palm…while also clutching a ball. It was my pleasure to paint Michelle, she posed naturally and beautifully, and I am ever grateful she had the Chutzpah to come out and ask me!